Melba Motors Belconnen is a well-known and highly respected business operating for over 30 years within the Belconnen and surrounding areas. Melba Motors Belconnen services all types of Vehicles old and modern. Melba Motors is recognised as the number one authority on most British makes and models, in addition to many of the older model Australian and Japanese Vehicles. 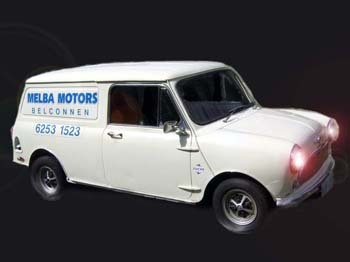 British Models serviced include: Mini, Triumph, Jaguar, MG, Lotus, and Morris. Melba Motors Belconnen is proud to be the preferred service provider for a number of Local Canberra car clubs and many of the surrounding public service office employees. Mick has extremely high ethical standards, and believes this is a strong contributor as to why he receives so much referral business, from his clients.Mick has a great repour with all his clients who really appreciate the personal touch he provides to the service they receive. Mick strongly believes in the concept of “customers for life”. © 2012. All Rights Reserved. Design by PCEZ Computers .